Last month I was fortunate to visit Sabbah Wasim and the Customer Service Team at Vax in Droitwich. Established in 1977 by Alan Brazier, whose first invention was the forerunner to Vax’s iconic orange tub (made with a water heater, a shower pump, and a milk churn), today Vax is the UK’s best-selling floor care brand and is the only UK floor care specialist to offer a comprehensive range of carpet cleaners, upright and cylinder vacuum cleaners, cordless, steam, and hard floor cleaners to the consumer and commercial sectors. The company has grown rapidly over the last few years. Based at the Droitwich site are the Warehouse Operations, Supply Chain and the Customer Service departments. At the head office in Birmingham you will find the Human Resources, Marketing, and New Product Development departments, among others. Developing home-grown talent is a core belief at Vax and something they strive to continue year on year. Starting an apprenticeship in customer services is a great way to get a foothold in the company. It ensures that after they complete their apprenticeship, the graduated apprentice will always have the customer at the heart of their decision making. Sabbah understands that people will want to develop in the business and move on to other areas within the business but that is not seen as a bad thing at Vax. It simply means that the company has developed individuals with Vax values and the right ethos to take them as far as they wish to go. In this way, movement within the company is celebrated as a great success of the apprenticeship scheme. During their apprenticeship, apprentices will work in all areas of customer service. This includes the live agent chat team, the non-voice teams (answering emails and white mail), the inbound call service teams, and the business support teams. This gives the apprentices a wide range of transferrable skills for when they finish their apprenticeship, which can be applied to any industry. 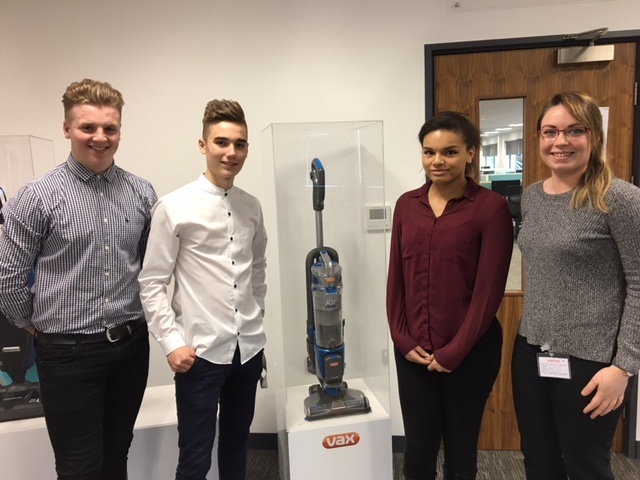 As an added incentive to continue their apprenticeship with Vax, apprentices are awarded a £500 bonus after their first year. Once they have completed their apprenticeship, as long as both the apprentice and company is happy with how the apprenticeship went, the apprentice is then offered a full time position at Vax in the Customer Service department should a vacancy be available. Lauren is an apprentice at Vax currently working within the live agent chat team. “When I first decided to apply for an apprenticeship after school, my grandma supported me with the application process. My mum was not so keen because she thought that the best way to get a good education was to go to college. During the application process Vax invited my mum, and other parents, to an open day so that they could get to know the company more and how the apprenticeship scheme would work. Tom is another apprentice at Vax, currently in his first year and working within the live agent chat team. “My friend, who works at Vax and did an apprenticeship with them, referred me to their Resource Planning team. I applied and was successful. My three older sisters, though, all went to university. Having said that, they, and my mum, were so supportive when I decided to apply. They all knew I would be good at an apprenticeship because they could see I wasn’t happy studying full time. I had previously completed my first year at Sixth Form College but wasn’t enjoying it. I took PE, Media, and Business Administration. If you would like to learn more about an apprenticeship at Vax, please visit their website here http://jobs.vax.com/jobs/department-apprentices/ and fill out the application form.